No,no this is NOT an announcement of any sort. Although after having 7 kids anytime I call some one and say I have news or that I have been not feeling well they assume it means I am pregnant. On Sunday we had a single friend over at our house right after Church. We were hurry to change out of our Sunday clothes before heading to a going away Open House for two families that are moving away from The Netherlands. As I was pulling the pork roast apart for the pulled pork we needed to take I was calling out instructions to all my monkeys. You know the usual “someone potty Mark, please”, “grab the little kids a change of clothes and change them please”, hurry please you only have as long as it takes me to finish this pork”. All normal things around our place. In my mind it was the usual hustle and bustle of our family. This cute friend of ours turned to me and said “it’s good to see your kids like this” to which my response was “oh talking?” because somehow I manged to have 6 shy kids and only 1 who will talk to just about anybody. Our friend said “No, calm and quiet” and I was thinking HUH?? Calm?? Then she said to me “have you seen the movie Cheaper by the Dozen? I thought your house would be like that”. This has me thinking. Do I portray a mom who is frazzled and overwhelmed? Or do I appear calm and under control? Either could probably be applied depending on when you find me on any given day. I don’t really recall too many moments of truly feeling overwhelmed except those typical mom moments we all have no matter how many kids we have been blessed with in our lives. You know the ones I am talking about a kid yelling at you from the toilet to help wipe their bum, dinner on the stove needing to be stirred, a load of laundry beeping at you from the other room, someone asking for help with an algebra problem all during the witching hour after school but before dinner. We all have those moments whether we have two kids or seven. We are all busy in our lives. We each choose how busy we want our lives to be and how we want to spend our time. So often I hear oh wow, you must be so busy if you have seven kids. I used to respond with a joke or an explanation of some sort and now my answer is just “no busier than you, I only get 24 hours in a day just like you”. Because at the end of the day that’s what it boils down to how did I fill my day. Am I so busy I can’t take my 2 and 3 year olds to the park and watch them play in the sand for 2 hours? What do I actually have that is so pressing? I had a mom just the other day tell me she doesn’t know how I attend everything at the school for my kids. I think she was looking for some magic answer from me on how to be in two places at the same time. Needless to say she seemed disappointed when I told her I don’t attend everything. I learned a long time ago they will ask me to attend the things that matter to them and the rest is not important. They also have learned that in life we make choices and sometimes it is between two good options so if I choose to attend another siblings activity instead it’s not because I love one of them less than the other it’s just because it was more important to the other sister or brother that I be there. SIS,you have wonder children because they have wonderful parents!!! !We miss you guys. Great thoughts Ruth. Each of us make choices and how we spend our time. I often find myself evaluating how I spent my time each day to see if I am really that busy with important things or not. More often than not, I was “busy” with non-essential things. Ruth, y’all are one of the most got-it-together families I know! With 7 kids OR 1!! Seriously. 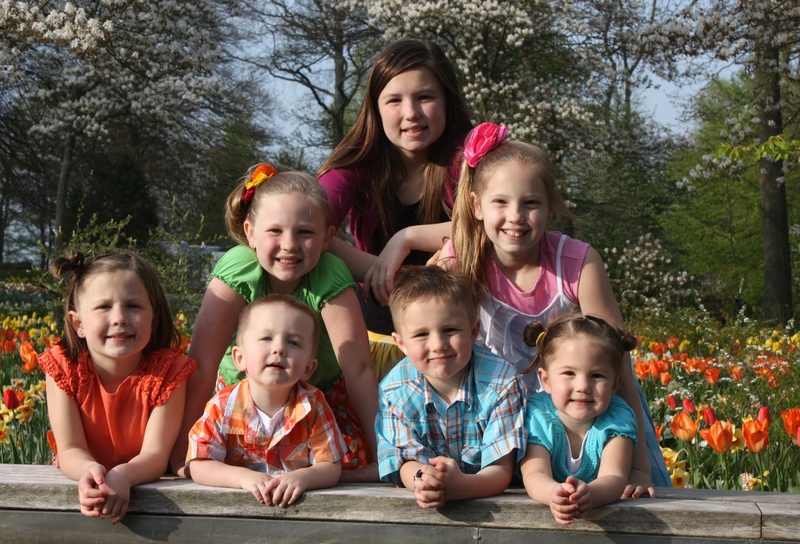 And I’m amazed that you have 6 shy kids… how did only one inherit that special Ruth gene?! 😉 Love ya!!!! I know I haven’t seen you in a while, but I just remember always being impressed by how organized you seemed to have everything! Excellent point about choosing what is most important. Sometimes Marcus and I freak out a little bit, because it feels like we are so busy all the time, and we only have two kids so far! And they’re just little, so we know things will just be getting busier. But, like you said, we’ll just have to figure out how to choose the most important things. 85% that’s not too shabby right?